This Hawaiian getaway at Westin Princeville promises an unforgettable experience in the tropical charms and exotic luxuries of paradise! Thanks to your thoughtful contribution, it will be time to take comfort in the sumptuous settings of the room, indulge in tantalizing cuisines, enjoy an array of thrilling activities and discover a place of peace and calm in the spa. Exploring the enchantment and mesmerizing beauty of the islands on this Hawaiian holiday will be a wonderful gift! With your lovely gift, the experience of a lifetime at Westin Princeville on this Hawaiian getaway awaits! Discovering the true essence of the islands includes lush natural beauty, pristine beaches, sparkling waters and the welcoming spirit of "Aloha". In paradise it will be time to luxuriate in the enchanting settings of the room, indulge in world-class cuisines, take part in thrilling activities, and journey to a world of tranquil bliss in the spa. Westin Princeville presents an exceptional island getaway that is just as alluring as it is mesmerizing! Champagne and chocolate strawberries will be delivered to the room, thanks to you! While on vacation, it will be time to indulge in a bottle of sparkling champagne and a platter of sumptuous strawberries dipped in milk chocolate. It will be pure bliss! With your wonderful gift, it will be time to enjoy a cheese and fruit platter on this vacation at Westin Princeville! A platter of rich, international cheeses and fresh, sliced tropical fruits will be delivered to the room. At Westin Princeville, this lovely gift will enhance this tropical vacation! The room will be beautifully decorated with a sprinkling of delicate rose petals or the rose petals can be placed in the shape of a heart on the 'Heavenly Bed' for the perfect start to an evening in paradise! On this Hawaiian getaway, it will be time to take delight in the fragrant abundance of a dozen roses in the room! A beautiful arrangement of delicate roses will be delivered to the room, enhancing the charming surroundings of this soothing sanctuary. This is the perfect gift! Thanks to your lovely gift, it will be time to tantalize taste buds with a sweet treat from the comfort of the private lanai. A platter of fresh, succulent strawberries covered in rich, exotic milk chocolate will be delivered to the room for the ultimate indulgence in paradise! At Westin Princeville, discovering a world of pure tranquil bliss with the Taro Butter Pohaku Massage will be a wonderful gift! In the serene settings of the spa, the body will be pampered with an application of taro butter while heated basalt stones are placed on key points of the back. The warmth from the stones and the soothing massage strokes will induce deep muscle relaxation and will renew the mind, body and spirit! It will be time to indulge in the Hawaiian Lomi Lomi Massage on this tropical getaway at Westin Princeville! The body will be massaged with fragrant essential oils of the islands, incorporating rhythmic touch and soothing techniques. This luscious massage will awaken the senses and rejuvenate the mind, body and soul! Thanks to your lovely gift, it will be time to take delight in the Organic Seaweed Oil Massage! The body will be drenched and massaged with organic seaweed oils, rich in vitamins, minerals and stress relieving marine elements. This luscious massage will refresh the senses and leave the skin silky smooth on this exotic vacation at Westin Princeville! On this tropical escape at Westin Princeville, discovering a world of peace and calm with the Hanalei Bay Ritual will be a wonderful gift! In the lavish surroundings of the spa, it will be time to receive the Organic Seaweed Oil Massage and a luxurious Detox Seaweed Bath before indulging in a refreshing seaweed tea drink. This spa ritual will end with the Organic Seaweed Repair Facial, the Organic Seaweed Pedicure and a spa gift from the sea! The Na Pali Boat Tour will be perfect for this Hawaiian getaway at Westin Princeville! After boarding a boat it will be time to cruise along the stunning coastline while witnessing magnificent views of the Garden Isle. Along the way, there will be playful dolphins, turtles and seasonal whales. This will be an unforgettable experience! Westin Princeville presents the opportunity to experience the Zipline excursion on this Hawaiian escape in Kauai! This excursion includes soaring high above the tree tops viewing lush foliage, winding streams and cascading waterfalls from a bird's eye view. Thanks to you, an exciting experience and a thrilling adventure on this getaway in paradise awaits! This vacation at Westin Princeville presents the Helicopter Tour! While flying above the Garden Isle, there will be breathtaking views of the majestic mountains covered in lush foliage and the stunning vistas of the sparkling Pacific Ocean. This helicopter journey includes witnessing the beautiful scenery of this luscious island paradise from a bird's eye view! The Kayak Tour will be an amazing experience! This tour includes a choice to kayak through the shimmering waters of the Pacific Ocean or along winding rivers and cascading waterfalls. This offers the opportunity to experience the breathtaking coastline and the dense, lush tropical beauty of the Garden Isle! On this vacation it will be time to take advantage of the tropical surroundings and learn how to surf! The instructor will teach the basics of surfing before catching some waves. This private surfing lesson is the perfect gift for this getaway in Kauai! With your wonderful gift, indulgence will be experienced in the enchanting surroundings of the Island View Deluxe Studio Villa! This tropical retreat is beautifully decorated with a rich palette of creams, whites and colors to enhance the dark hardwood accents, the fine furnishings and Hawaiian design. The spacious villa boasts a queen size 'Heavenly Bed' with luscious linens, plush bathrobes, luxurious amenities, a separate shower and a whirlpool tub in the 'Heavenly Bathroom' and a private lanai with stunning views of Kauai! At Westin Princeville, the Island View Deluxe One Bedroom Villa offers an unforgettable experience! Beautifully designed with a spread of fresh creams, lavish whites and warm colors, the Hawaiian decor will be enhanced by the tropical hardwoods and the fine furnishings in the living, dining and kitchen areas. This spacious sanctuary presents a king size 'Heavenly Bed' with luscious linen bedding, plush bathrobes, a 'Heavenly Bath' with luxurious amenities, a whirlpool bathtub and shower and a private lanai with outdoor furnishings to sit back, relax and admire the breathtaking views of Kauai! The luxury and elegance of Kauai will be revealed in the setting of the Island View Deluxe Two Bedroom Villa! This villa is beautifully decorated with Hawaiian design, exotic hardwood accents, a fresh palette of warm colors and fine furnishings in the living, dining and kitchen areas. This spacious villa boasts a king size 'Heavenly Bed' in one room and a queen size 'Heavenly Bed' in another room, both with luscious linen bedding. A 'Heavenly Bath' with lavish amenities, a whirlpool tub and separate shower will enhance relaxation while the private lanai with sweeping views of Kauai will complete this exceptional stay at Westin Princeville! Thanks to your thoughtful gift, a magnificent dining experience will be in order at Westin Princeville! In the charming indoor settings of Nanea Restaurant and Bar, it will be time to enjoy sumptuous island inspired dishes including sandwiches, crisp salads, juicy steaks and fresh seafood specialties for lunch and dinner and indulgent tropical concoctions and classic cocktails. From the terrace there are breathtaking views of the alluring Pacific Ocean and the sparkling blue pool. Princeville Market boasts sumptuous offerings. For breakfast, there are choices of a variety of freshly brewed coffees, breakfast sandwiches, lox and bagels, fresh fruits, home-made pastries and more. For lunch or dinner, Princeville Market offers deli sandwiches and salads, pizzas and paninis, marinated meats and island fresh fish. Thanks to you, a relaxing meal from the comfort of the villa or at one of the poolside grills will await! This getaway at Westin Princeville offers the Stay at One, Dine at All meal plan! It will be time to tantalize taste buds at the charming restaurants at St. Regis Princeville or indulge in enticing cuisine at the exquisite restaurants at Sheraton Kauai. Thanks to you, discovering the ultimate indulgence and savoring the flavors of paradise will be an unforgettable dining experience! 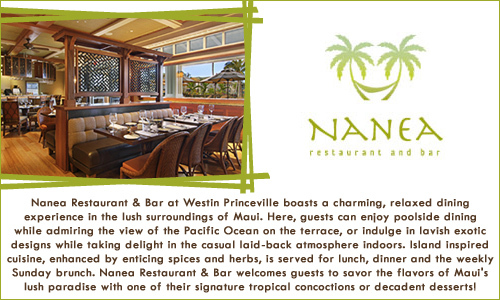 Westin Princeville offers a relaxing dining experience in an exotic setting at Wailele Dining and Bar! This restaurant boasts a sumptuous menu of fresh sandwiches, enticing appetizers and local favorites, accompanied by a wide selection of tropical concoctions. Thanks to you, this vacation will be enhanced with tantalizing dishes and the enchanting ambiance of Kauai!